Mmmmmm. I'm having olives in my pasta tonight. Most of the time these little things make me nauseous. Tonight is no exception. But I'm trying to get ready for 3 weeks in Athens and I know I'm going to have to eat olives. I did the same thing when I went to Taiwan for the first time. I visited the local Chinese food places here in town, sampled the food, and learned how to use chopsticks. Lot of good that did. For my efforts I won a bout of food poisoning, and a trip to the Taipei hospital, followed by three days of eating Snickers and Pringles because they were the only foods I trusted. Not one to be intimidated by a single bad experience I'm at it again, this time with olives. Tonight I'm going to go on a little bicycle rant. I've been taking it easy on bike talk because I know a lot of the people reading my journal aren't real bike savvy and I didn't want to get in over anyone's head. But all I've accomplished is to make my entries really dry. It's easy for me to get excited about my races though, and I write much better that way, so prepare to be initiated into the world of bikes. My time spent at the Olympic Training Centers this year is definitely paying off for me on the road! I've won two criteriums since I got back, both times in break-aways. If you're not familiar with my racing, I focus all my training on events that last about a minute. For me to be winning hour long races, and to do it by breaking away, not just sprinting at the end, is very rare. My race this last Saturday was a moment I've been waiting for all year. I do my road racing mainly to help the younger riders on my team who are coming up through the ranks still. For the last couple of years I've raced with two very talented guys who are bound to be getting a paycheck to race their bikes in the near future. I did my best to help them learn effective tactics and stategies that will win bike races for them. This year they both moved to a different team (a team that is currently ranked as the number one amateur team in the nation) and I've been looking forward to racing against them instead of with them, to see what they've learned. 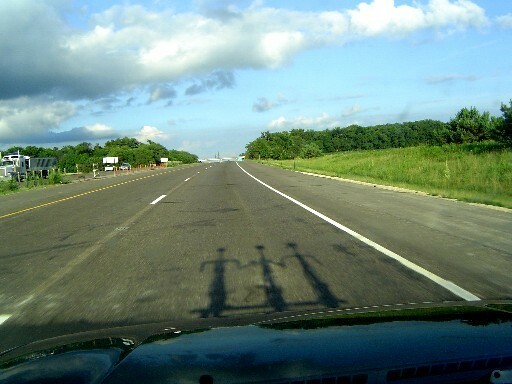 Our break-away consisted of three riders. The were; Frank, who's been one of the top riders in the midwest for several years, and I think he just recently finished in the top fifteen at the national championships as well, Nick, my former teammate who won the Best Young Rider jersey at the Nature Valley Grand Prix, and me. Right from the start these guys were pushing me to my limit. They were taking turns pulling at the front and I was hanging on the the back of them for dear life. After a few laps of this Nick got sick of it and tried to make me start working (smart decision). Unfortunately he chose to force me into it by letting Frank drift away in hopes that I would really desperately want to stay in the break, and therefore start working. Now let me take a break from my story to explain racing a little. Bike racing is very much a team sport and the primary goal of most teams is to get a rider in a break-away in an attempt to increase their odds of winning. A race will often start with 50-70 riders and any given team will have 4-6 members in the race. So you can see where placing even one man in a five man break-away is a desirable thing. Now once a teammate is in a breakaway the race changes dramatically for the team. The team members still in the pack(or field) try to contain the race as much as possible, slowing the pace down when they can and discouraging anyone else from trying to bridge the gap up to the breakaway. Meanwhile, the teammate in the break is usually working as hard as he can to increase the advantage the break has over the field. However, going back to what I said about increasing the odds, the rider in the break has to be concious of the fact that if he works so hard in the break that he eventually tires and gets dropped by the other members of the break, he has now decreased the odds of the team winning. Once the break no longer has a teammate in it the team members back in the pack are suddenly faced with the responsibility of pulling the break back, which takes a lot of energy. If they succeed they will definitely be more tired than if the break had never gone away in the first place, decreasing the odds of finishing well. If they don't succeed they have no chance of winning because they don't have anyone in the break. Therefore, the absolute golden rule for a rider in a break-away is DON'T GET DROPPED. While the break is forming the riders in the break effectively form a truce and they all work together towards the common cause of getting a gap between the break and the field. However, once the break has been safely established and there is little chance of the pack catching it, the truce is over. At that point the riders on teams other than yours are no longer useful and it's time to get back to the task of getting rid of as many of them as possible in an attempt to increase your odds at the finish again. And THAT is a really rough definition of racing tactics. But it should be enough to get make the rest of this story make sense. Where was I? I know, we're in a breakaway that has one guy from my team (me) and one guy from Nick's team (Nick). So already this race is going better than my team had planned it. Nick's team had us out-manned and generally had stronger riders so we were hoping to place one guy in a break with no more than two from Nick's team. Nick is in the process of trying to force me to work by letting Frank ride away ahead of us until I do the work to close the gap up to him. Unfortunately for Nick I'm pretty sure there is a big flaw in his plan and it's one of the two following things. 1) I know that he has as much responsibility to stay in this break as I do, so he can't afford to drift back to the field as that would force his team to waste their energy chasing Frank down. 2) He has completely forgotten about his team and is obsessed with the fact that he's in a position to win the race for himself. Nick new he needed to get rid of me, but he apparently hasn't quite learned how to yet. These were his options; 1) try to drop me by taking me off the back like he did, 2) refuse to work and allow the break to get swallowed by the pack, knowing that it was a very good bet that another of his teammates would get in a more favorable break 3) get me to start working in the break in hopes that I would tire enough that he could get rid of me later. Number 1 wasn't likely to work for the reasons I explained, two was the best option but a very hard one to pick since it means sacrificing your own success for the team, three was a pretty good choice too, and it's what inadvertantly happened as a result of Nick trying number one. After letting Frank get pretty far away without any reaction from me Nick closes the gap back up and starts yelling at me about how he's going to make fun of me in his race journal (I'm not the only one who keeps one of these). Somehow the thought of being shamed on another guys website isn't as scary as letting all my teammates down by dropping out of the break. Anyway, Nick slowing down for that short period of time when he was trying to get me to work allowed me to recover enough that I actually could begin to help. This makes everyone happy, because I truly do want to see the break get away, I was just too tapped to do anything about it up 'til that point. At that point we had about 35 more minutes to race and we settled into that truce I talked about where we all helped each other in an attempt to increase the gap between the break and the field. The only catch is that both these guys are on a completely different level than me and I was only do about half the work I should have been doing, and even that was killing me. Now, what should have happened next, maybe about 5-7 minutes before the race ended, was that the truce would be broken. The only way to really tell when the truce is over is when one of the guys in the break blasts buy you at mach 10 and you have to dig really, really deep to get up to speed and close the gap up to him. From that point forward everyone gets really nervous and shifty and the break goes from one nice steady pace to a series of fast-then-slow accelerations as everyone tries to break things up and get the advantage. I was in the fortunate position of being the fastest sprinter in the group so my job was actually to keep the group together and rolling smoothly so I could get to the final lap without having to sprint after any attacks. On top of being the fastest sprinter, I also had only done a fraction of the work I would normally be obligated to do so both guys should have been very interested in getting rid of me. I knew this and as soon as we got in that 5-7 minute range I started keeping very close tabs on where everyone was, but truthfully I was so tired it would have been tough for me to respond to a good attack. I'd like to point out that despite the fact I'm a very competitive person I really wanted Nick to win this race because he was quite a bit stronger than me and it would have meant he actually learned some of the stuff I was telling him for the last couple of years. Unfortunately Nick was nowhere to be found. He passively let the break continue on all the way until the final lap. And then he didn't even sprint me because he was so convinced I was going to beat him. So I won a race I really shouldn't have been able to win and I found out I've got to do something different when I'm trying to convey bike tactics to the next group of guys I work with. I sure hope he learned his lesson the hard way on Saturday, since he clearly hadn't learned it the easy way in the two years we raced together. That's the end of the little road races for me this year. I actually get a chance to race on the track next week when I travel to Blaine, MN for Match Sprint Madness (more explanations of bike racing to go with that), and then it's back to Wisconsin, and mainly the Milwuakee area for SuperWeek, which is a series of road races and criteriums (a road race held on a very short course, typically around a few city blocks) that brings in a good amount of pro and top-level amateur riders from across the nation. I'll be competing in those purely for fitness, since the speeds are high enough there to keep me hanging on for dear life from the moment the gun goes off. One questionably sound car, 3 bikes on the roof, and the call of the open road. This weekend was time for me to get my drive on. I'd forgotten how much fun a good road trip can be. The key is to insist on following all road trip customs. Such as food at questionable roadside joints, hotels only as a last resort, and a healthy disdain for sunscreen. This weekend was Match Sprint Madness in Blaine, MN. My first chance since February to really test myself out against other riders on single bikes. Don't get me wrong, I'm having a lot of fun with Matt on the tandem, but it's really hard to judge your own personal fitness when all of your times and results are part of a joint effort. So this was my chance to assure myself that yes, I was indeed pulling my own weight on the tandem. This weekend was the first fairly warm, humid weekend of the summer for me. Perfect conditions in the sense that this is what I can expect in Athens. Add to it that I would be racing a match sprint (one of my events in Athens) and the races would be on a 250 m velodrome (same as Athens) and I couldn't have been happier. In a display of my great mental genius I pulled on my skin-suit and put sunscreen on any exposed skin. Then I proceeded to roll the skin-suit down to my waist so I could warm up with just a sleeveless undershirt on. For the next 8 hours. Not that I had originally intended to stay at the track for 8 hours, but these things happen. Now, to add to my perfect farmer tan that stops at my shirt sleeves, I have bright red shoulders that haunt me every time I roll over in bed or try to throw a backpack on. Oddly the burn stops an inch short of where my farmer tan starts so I'm destined to have an even dorkier tan than I already have for the rest of the summer. Racing went well. Only 4 people showed up for my event unfortunately, but I took the win fairly easily and got some good practice on my tactics, something I can always use help on. Afterwards my friend, and competitor, Chris hopped on the motorbike and took me out for some motor-pacing. To do a fast kilometer time trial there are two magic numbers that need to be hit. One is a 20 second opening lap. The other is consistent 15 second laps after that. Matt and I had yet to see that kind of speed in our previous camps. Today I got under it, several times. I can't wait to get out here with Matt in a few weeks to see if we can start consistently getting under that mark on the tandem. I spent Saturday night bandit camping on the edge of a summer camp where I used to be a counselor. Woke up Sunday morning to a wonderful thunderstorm overhead and a tent screen covered with mosquitoes patiently waiting to get their shot at me. In the 5 minutes it took me to take my tent down and get back to my car I must have taken at least 30 mosquito bites to the legs. I looked like I had some terrible, chronic skin disease. From there I had hoped to go down to the bakery we used to take the kids to when I was a counselor. It was closed so, being in a heavily Swedish area, I started looking for a place to get some good crepes. Still no luck. There happened to be a Sunday pancake breakfast going on at the local church so I think out of respect for that all the little restaurants had stayed closed that morning. Well, I hadn't been to a pancake breakfast in a while anyway. Now, I've been to pancake breakfasts before and I thought I grew up in a little town, but I guess I really grew up in a medium sized town. My memories of pancake breakfasts were of a large room with at least 100 people having their pancakes and sausages. Somewhere you could easily blend in. I paid my $5, got the "who are you" stares from the elderly gentlemen that were manning the ticket counter, and then ducked into the dining room. Which had approximately 15 people in it. If I had to put money on it I'd bet everyone there had known everyone else there for at least 15 years, if not 50. Fortunately I spied a gentleman who was sitting by himself. That would make for easy conversation. Of course, unless there was a really good reason he was sitting by himself. This gentleman's name was Bob. Bob had been in the area most of his life but had not lived a dull life by any means. Over breakfast I heard stories of a recent 50 year class reunion, advice on what you should look for in a wife, and best of all, stories of sailing off the coast of China in the 50's. Bob had been in the Navy, and had been to over 30 countries and every state in the union. He'd manned one of the guns and had ample opportunity to use it. From the way he told it I was almost surprised his destroyer hadn't single-handedly moved the world from the cold war into WWIII. I'm not sure why nobody was sitting with him. I'd sit with him again. This was going to be a good day I thought as I stepped out of the church, back into the pouring rain. I wouldn't have gotten this with a cheap hotel and a Perkins breakfast. The rain cleared up as I made my way over to Hopkins, the site of Sunday's race. I had intended to train on the track today but nobody was going to be there to let me in so I decided to do a local road race instead. This one would be a short, 4 corner criterium in downtown Hopkins. It was all part of the Raspberry Festival that was going on. Soon it was sunny and getting a bit muggy again. I found a little coffee shop to hide out in for most of the day, since I didn't race until three. I had the best conversation with the lady running the place and ended up autographing a piece of paper for her daughter. She came out from behind the counter and sat with me between customers. We swapped stories of San Diego, where she was from, and talked about the fun of road trips, and the challenge of finding good places to sleep in your car. This is what I love about being on the road. The joy of meeting strangers. Bob had made my morning with his stories of sailing on a destroyer. Now I was making this lady's day with stories of Paralympics and road trips. By the time I left we were high fiving each other and I was promising to stop back in after the race to show her my bikes. The race itself was bigger than I had expected. SuperWeek is going on in Wisconsin right now and since it's the biggest bike race series the midwest has to offer I had assumed all the big guns would be there, leaving me some relatively easy pickings in Minnesota. Nope. Since SuperWeek had just started and it runs for the next two weeks everyone had decided to stay for the Raspberry festival and leave for Wisconsin that night. The race started fast. Faster than I can remember any local race in Wisconsin starting. I had forgotten how different the style of racing was up here. Grand Performance (GP), a team that was ranked as the top amateur team in the nation just a few years ago, was here in full force and they were driving the pace and keeping the race aggressive at every possible turn. It took me a while to figure out the pattern of the race, since it was so different. Instead of small breaks getting up the road the pack would routinely split, with a group of 8-20 going up the road, out of a total group of about 50. I was happy that I was strong enough to be an active player while this was happening, and I was making about half the splits. 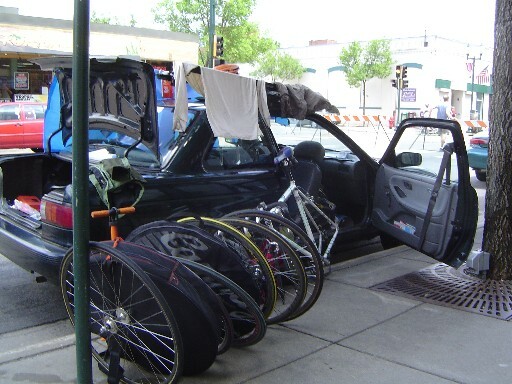 It's tough as a rider without a team (I have one, just not when I'm traveling alone in MN) to cover all the potential moves, and getting in half was more than I had expected. Finally, after about 45 minutes of this incredibly fast, hectic style of racing, the GP team let 5 or 6 guys get up the road with only one of their team in it. They decided that wasn't good and brought most of the team to the front to chase. This was a good sign for me. The team driving the pace had shifted from offensive to defensive. After they brought the break back the pace slowed down, since they were a bit too tired to keep the attacks coming, now that they had done all that work chasing. I decided the odds of the race coming down to a field sprint had just shot up to about 80% so I rolled the dice and went to sit at the back of the pack. It's easier to ride back there but if anything were to move up the road I'd have no way to respond, and that could lose me the race. On the other hand, if the race came down to a sprint I'd be rested and ready, which I'd need to be because without a team I'd have to fight for position for the last 3-5 laps and still have enough left to sprint. So I'm sitting at the back and I've been eyeing up the sprint almost every lap since I got here. It looks like a pretty easy one. There's only 100 m out of the final corner and almost nobody is going to be able to pass in that distance so it is the 200 m long third straight where all the action will happen. I'd like to come into turn three in second or third and start the sprint shortly after the corner, making sure I get to turn 4 first. However, I think I've got enough speed that if I were to take the lead right before turn three I'd be able to hold people off down that straight and still make turn four in first. With about 15 minutes left in the race a group of about 15 split and go up the road. I'd seen it happen so many times already in this race that I wasn't worried. At 10 minutes to go they were almost getting out of site of us on the short straights of the course. This was not good. GP had several riders in the move and they were actively working the front, discouraging other riders from chasing. I got nervous and went to the front, laying down a pretty good pull that brought the group back a little closer. Other people were starting to get inspired too, and as we switched from minutes to laps (the race was 120 minutes, but the last 10 laps would count down from 10-1 so we could better judge how much racing was left) the pace picked up and we started to bring the group back. By 6 to go there had been a flurry of attacks in the breakaway and one rider (GP) had gone up the road solo. Now the other GP riders in the break wouldn't work and it soon fell apart and came back. Sprinting is a learned art and it takes a while to develop the right reflexes to be able to put yourself in the right place every time, but there are some relatively basic rules that will get you generally where you need to be to win the race. First, with 5 laps to go you need to begin moving to the front. As soon as everyone else starts trying to move to the front it will become fairly difficult, but with 5 to go it's still fairly easy. Second, with three to go you must be in the top 5 (to 10 in a really big race). This is the drop dead last moment to get to the front. After that it will require a considerable amount of energy. Third, surf the pack. A pack is dynamic and people always move up the sides, which necessitates the the people in the middle must be moving backwards, since not everyone can stay at the front. If you can learn to stay on the outside edge, you will be able to stay at the front without too many big efforts. So as we entered 5 to go I was moving my way through the remnants of the break as we were catching it, working my way towards the front. At 4 to go I was there. One solo rider was still keeping a decent gap off the front, but if things stayed like they were now I'd have a chance to launch an early sprint to catch him at the line. We hit three to go in much the same situation. Nobody had come to the front to pull the rider back in, but there was enough nervous energy to keep us moving at about the same pace he was. Two to go, a rider comes to the front and lays down a hard pull, cutting deeply into the solo rider's lead, and catching him as we enter turn 4, about to get the bell signifying one lap to go. I'm in third position. The rider that had been doing the chasing pulls of. The guy in front of me has no interest in pulling for the last lap so he slows down too. I coast along side him and do the same. This is not a good situation. I'm in the middle of the road moving slowly. It would be easy, and really likely, that someone will come flying up the outside of the pack and I'll be in danger of getting swallowed by riders from both sides. With less than a kilometer left, that would be fatal. I look left. Everyone is nervously waiting for the other shoe to drop. We know it's going to happen. I look right. Same thing. Back left. Right again. I hear it coming from the left. That telltale sound of tires under a sprinting rider. I start to sprint as I swing my head back to see who it is and how fast he's going. The rider isn't coming that fast. This will be easy. I fall into third in line again as we dive into turn one. He drives it down the second straight and into turn two. We're not going fast enough to stop people from passing but nobody is trying to pass just yet. We hit the backstraight, up against the right side of the road. We're still not moving fast enough to be safe. There's a "thwump, thwump, thwump" as a rider comes sprinter up the right side gutter. I break left and come around the two guys ahead of me, just as the rider in the gutter clears them on the right. I've got to make a decision. Do I beat him to the corner and take the sprint from far out, or do I risk trying to get his wheel, where I could get pinched out in the corner, or lose out to another rider going for the same spot? I give it a little extra kick and get to the corner first. Coming out of the corner I keep it at about 80%, slowly bringing the speed up but not wasting any more energy than I have to. The wind is a little tougher here than I thought it would be. I'm about 175 m from the corner when I hear someone coming up on my left. I kick it down another notch. Now I'm at about 90%. 150 meters to the corner. I get nervous and kick it down that final notch. Now I'm at full throttle. This is dangerous and I may have just thrown the race away. The way sprinting works as long as I'm accelerating I'll be tough to pass, but once I top out a rider can use my draft to slingshot around me. 100 meters to the corner. 50 meters. I'm topped out. Now I'm officially a sitting duck. It will take me about 4 seconds to close that 50 meters to the corner. Damn this headwind is tough (looking back at my max speed later I'll notice I only hit 34.5 mph, vs the 40+ I would expect on a flat, windless road). 10 meters. I set up for the corner and look to my left. Damn, a rider from the Flanders team has taken me on the inside and he's too far up on me to shut him down in the corner. He's going to get through the corner first and it's going to take a miracle to bring him back after that. I've lost the race. I pop out of the corner and finish off the job to hold on to second. Back at the coffee shop I trade high fives and hugs with the lady behind the counter. I meet her daughter, who has come over to watch the race. She hooks me up with some coffee spiked hot chocolate (coffee is yucky, but a little bit of it keeps me awake) and a muffin for the long trip home. One more weekend closer to the big goal and all systems are go. This week has been a rough one for me. It was supposed to be a rest week, and rest weeks are always dangerous. I think it's because mentally you let your guard down and think of it as a week that's not important, but of course they are all important. Add to that the stress of me attempting to cram as much work as possible into my "free" week and the there's a good chance of getting sick. And sick I am. So I've been staying away from the bike, trying to keep my work load down, and soothing my sore throat with chocolate pudding and Ben & Jerry's Karamel Sutra ice cream. I would strongly recommend that last one for whatever ails you. Unfortunately that means I won't be racing SuperWeek tomorrow. That leaves Sunday as my only chance to race SuperWeek. If I don't race it will be first time since 1997 that I haven't raced at least part of SuperWeek. It's always fun, fast racing so I'd hate to have to wait until next year to race it, but sometimes stuff like this is going to happen and gold in Athens is my goal this year, not SuperWeek.